Sitting around waiting for a drained phone to charge can be maddening. Thankfully, charging technology only continues to improve. Case in point: the compact and versatile Nifty C PowerPod Battery Pack, now just $49.99 in the TechnoBuffalo Deals Store. With the super-charged Nifty PowerPod, you can shoot juice into your energy-starved devices at a previously unthinkable rate. Plug in your smartphone and the PowerPod will power it up to six times faster than with a traditional charger. 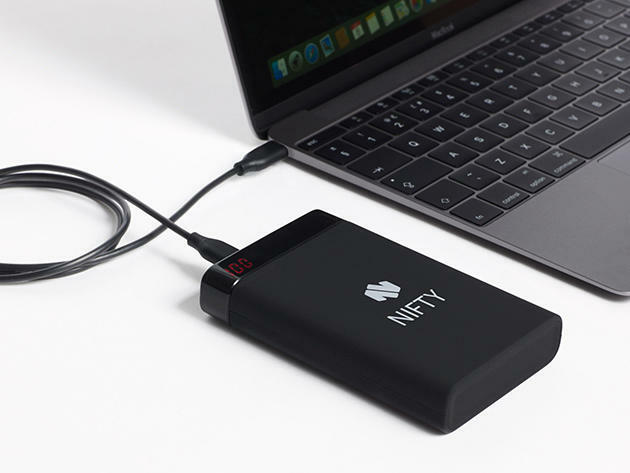 Use it to charge other USB-compatible devices like GoPros or vaporizers, and you'll see that rate soar to nine times faster. And to the Nifty PowerPod, USB doesn't just mean the traditional old USB. With this unit, you can plug in either the old-school USB Type A connectors or a trendy new USB Type C device. That means you can even charge up the new MacBook Pro, which is just the latest high-profile product switching over to USB Type C compatibility. You may quickly find that this ultra-portable batter pack is the only charging device you'll need. Pick one up at the low price of $49.99 while this offer lasts in the TechnoBuffalo Deals Store.